Bike lanes now on both sides of 5th St.
Workers put the finishing layer of asphalt on 5th St. between Water St. and Washington this week in downtown Northfield. And bike lanes were added on both sides. I just saw these Thursday night. They might only be two blocks, but they are absolutely beautiful! We’ve got a long ways to go to see the full park/trail master plan implemented, but this is a good start. Folks might also be interested in knowing that the surface of the Water Street parking lot is now porous– limiting water runoff straight into the river. While we’re on the subject of bikes, the Northfield News reports that a bicyclist was injured when a car struck her bike in the intersection of Woodley and Division. What? This can’t be right. That was my reaction, Patrick. I would like someone, like the police chief, to point out the exact statute to me. I would like to have confidence that the police are not just inventing statutes on the spot. I think if you are riding on the sidewalk you have to act like a pedestrian in a crosswalk–you can’t go wailing across the street willy-nilly from any corner. But if you are a REAL bike rider you are in the drive lanes and you would stop at the stop sign and go when it is your turn like any other vehicle–and you would not be in the cross walk at all. 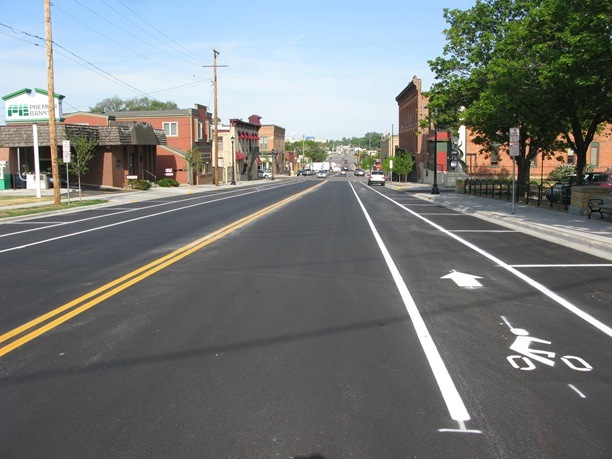 Yes, the bike lanes are beautiful and take Northfield a little closer to a “complete streets” approach. They will help encourage cyclists to stay off downtown sidewalks also. I don’t know the specific law Chief Taylor is referencing. I agree with Jane’s comments above. One thing about striping: I’m not sure the city’s method of painting stripes is adequate–that is, the stripes don’t seem to last very long. I haven’t seen the same problem with street markings on Highway 3, so I’m wondering if a different material is used there (epoxy paint?). Bill- I think you may have something in the materials used. One of the drawbacks in changing formulas to meet EPA guidelines is that some of the materials used are not as durable. I’ve had a problem with the “fading lines” used by municipalities for some time. It is especially difficult to see these lines on a rainy night. The one thing that will make these stripes actually work is if we motorists will actually be aware of cyclists. Having the lanes beside the parking spaces is a good reminder to look not only for approaching cars but also for cycles when pulling out of a space. We can have all the laws and regulations and designated lanes in the world, but if no one really cares or pays attention, none of them do any good. Changing behavior is a long process, unfortunately. There’s more information from Suzy on Nfld News in the comment section of the article you linked to. Apparently, Chief Taylor meant what he said about his interpretation of the law – that ““Minnesota law requires… that bicyclists walk their bikes across crosswalks.” – but I can’t see that the section of the law that he cites supports his position, either. or crosswalk under their jurisdiction. This almost sounds like there is room allowed for city governments to address specific crossings within their jurisdiction without running afoul of the state. I personally think a cyclist would get more respect from a motorist if they are walking their bike in a crosswalk. They are definitely being a pedestrian in that case. But how would that work downtown? We’re asked to ride in the street, and act like motorized traffic. Would we now be expected to instead get off our bikes at every intersection and walk through it like pedestrians? People think we get in the way and hold up traffic now? This proposed interpretation of the law would truly make us unpopular, as we slowly ambled through each intersection, then remounted our bikes in the street on the opposite side. I assume that is a cyclist is riding in the street they would not have to get off their bike but if they were in the crosswalk then they would have to walk the bike across the street. When my family rides our bikes downtown we ride in the street and ride thruogh intersections the same as a motorized vehicle. However when we cross Hwy 3 we get off our bikes and walk them across the highway using the crosswalks. My kids are very young and I don’t want to risk them tipping over in the Hwy. I much prefer they walk the bikes across. John, in your comment (#8) I agree that we ALL have to pay more attention to what is going on around us. This would include the folsk on bikes. Lately I have seen so many bikers disobeying the law — flying through stops signs, etc. I fear for their safety. In today’s society it is ever so easy to get distracted from watching the road while driving and lives can be changed in the blink of an eye. I think Jane nailed it. bike riders on sidewalk should obey like a pedestrian and riders on the street behave like a car. Arlen, I agree cyclists need to obey the laws. It drives me crazy to see them blow off stop signs on division. So do drivers. I’d say 80-90% of the drivers on Jefferson parkway near the soccer fields are speeding by about 30% over the legal limit. It’s crazy that we accept this behavior. This morning I had a driver fail to yield at at a stop sign, fly by me doing 50? flip me off and blow through a stop sign at Prairie and 4th. 3 violations in one block on top of the rude behavior. he was driving a tan Mercedes. I didn’t get the plate. He must have been late for work, because he felt the need to save 2 seconds. Yes, if the cyclist is riding on the street, they’re generally not crossing through an intersection at a crosswalk. Cyclists are generally more visible to motorists on the street than on the sidewalk. We do need more education of cyclists. I’m happy to say that the Safe Routes to Schools grant is paying for some local folks – including Thad Monroe of the police dept. and Greg Sumner – to be trained as “League-Certified Instructors” (through the League of American Bicyclists and the Bicycle Alliance of Minnesota). I hope we can have a lot of people take courses from them, including K-12 students and college students. See the links I’ve included for class info. Both can be used to register for courses offered this summer in Minnesota. Patrick- I was talking about cyclist using the crosswalk for pedestrians, not the bike lane. If I understand Chief Taylor’s comment, I thought he was refering to this, also. It would definitely be counter productive to traffic flow for cyclists to always walk their bikes through an intersection. Arlen M.- I certainly agree. I have seen the same thing happen with cyclists. I saw a college age person ride out in front of a garbage truck at the intersection of St. Olaf and Lincoln one day. The truck was half way through the intersection when the cyclist, who was riding on the sidewalk, zipped right out in front of it. The driver had to make a panic stop to avoild hitting the cyclist. It would seem pretty evident from the statute link in Patrick’s post above that cyclists are not considered pedestrians when they are on the roadway. I think it is very good that the state is getting serious about seat-belt use. The next thing should be I-Pod and cell phone use while operating a vehicle. Distracted driving is just unsafe in any situation. I understood what you were talking about. I am less clear about what Chief Taylor meant. Patrick- Yes, I agree. I didn’t see his verbage in that statute, either. The only thing that came remotely close was the section I quoted. Is there any other statute under which this might be addressed? I don’t know where to look. I haven’t found anything to support Chief Taylor’s statement. Here are some resources: MnDOT’s “Bicycling in Minnesota” page and Julie Kosbab’s page on Minn. Bicycle Statutes. I was riding down 5th yesterday and came to the Water Street intersection and oops they ran out crossing the bridge…scary when you’re the one on the bike…so, yes, there’s more to be done to make it safe for bikes. Likewise, the lanes on Hwy 3 provide some comfort, too, though I still find it hard to trust that the Hwy traffic will look out for me well enough when I’m on them. Everyone wants to get where they’re going as fast as possible and highway planners make that a priority. Going south, past 5th, the bike lanes also run out crossing the bridge…now that is scary…so, taking the sidewalk is still the better part of valor…even if it may be against the law, it’s safer. One thing though is that drivers, when they park along city streets, don’t aways think to look for bikes coming when they open their driver’s side doors to get out. I nearly got creamed yesterday on 5th across from the News when a driver opened his door as I was passing. A second or two earlier and I’d have been badly injured. Fortunately I saw him and could swerve…and thank goodness no car behind me at the time. But, we’re on the right track in Northfield…the more designated lanes the better. For one thing, it will remind drivers to be more aware that we cyclists are around.